It’s not often that bridges made of dry spaghetti, robot wars and culinary arts all go together, but today they certainly did at CNC. 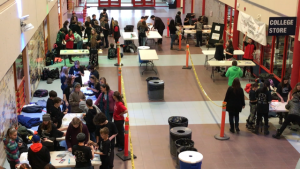 The College of New Caledonia hosted the fourth annual Regional Skills Competition and Trades Day at its Prince George Campus, featuring nearly 300 elementary, secondary and post-secondary students. 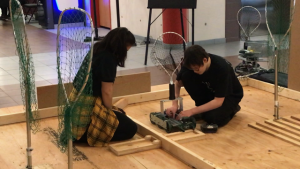 The participants, including students from Prince George, Quesnel and Vanderhoof, competed in culinary arts, robotics, spaghetti bridge building, wind turbine building, welding, automotive service, cabinetmaking, carpentry, electrical and heavy duty mechanic competitions. “It’s inspiring to see so many talented students showcasing their skills throughout this competition,” said Frank Rossi, CNC Dean of School of Trades and Technologies. The competition at CNC has experienced significant growth with more than 100 more competitors than last year. This year, the event also added three new competitions including welding for secondary students and automotive and electrical wiring for post-secondary students. “We’re proud of the success this competition has experienced at CNC,” Rossi said. Winners of the Regional Skills Competition have the opportunity to represent the Central Interior Region and CNC at the Skills Canada BC’s 2019 Provincial Competition in Abbotsford April 17, 2019. Winners at the provincial level are invited to compete in the National Skills Canada National competition.